Oh my these look tasty. Ice cream bar in the flavor of cake batter rolled in what looks to be Fruity Pebbles? Yes please!!! They looked just as nice in person (sorry no photo) but trust me they looked just like the photo. The only problem is the bar itself. It does taste like cake batter….but it doesn’t have the consistency of ice cream. It actually has the consistency of what I would think almost-but-not-quite-frozen-cake batter would taste like. The consistency of this throws the whole thing off for me. it’s almost chewy. Chewy ice cream? uh…..no. A shame too because I thought this one was gonna be a homerun. Holy smokes. This ice cream is rich and decadent. Chocolate and Raspberry Ice Creams with Fudge Chips and a Raspberry puree-jelly-type core? It’s almost depressing that I sat here and ate the entire carton watching cartoons instead of writing a more in-depth article about how yummy this is. If you love chocolate-raspberry together…shut up and go get this now!!! Categories Addictive, ice cream, This S#!+ is ADDICTIVE!! Great Googly Moogly this is so close….that I just wanna lay down and cry. 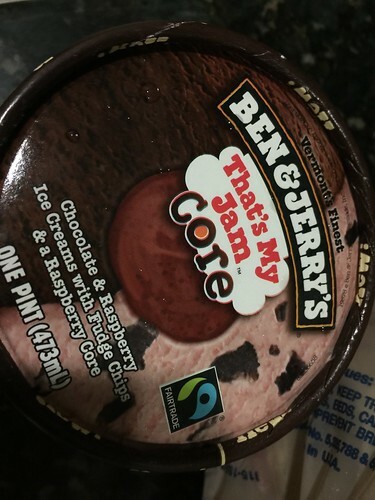 Once upon a time – B&J made the most incredible ice cream ….in the history of ever. It was Chocolate Ice Cream with Peanut Butter Cookie dough in it. 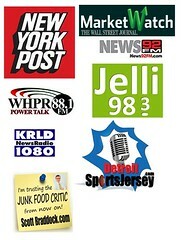 Read about my love affair with it here. …and of course it was discontinued. 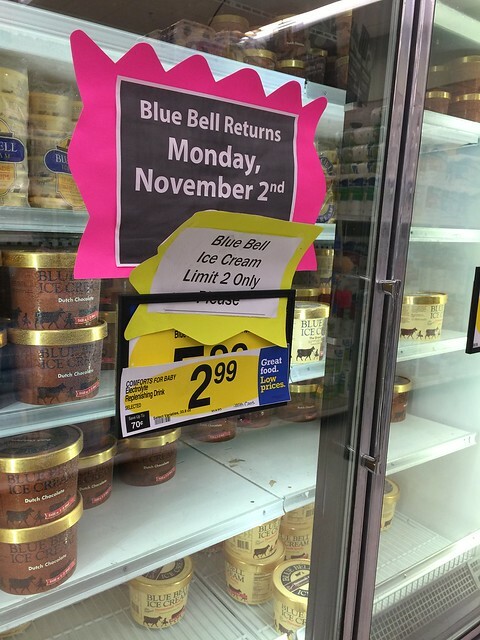 Seeing this freaks me out because it is SO close to that original ice cream. This is also promising because it tells me they still have the ingredients to make the one I want brought back…should they ever grant my wishes and do so. 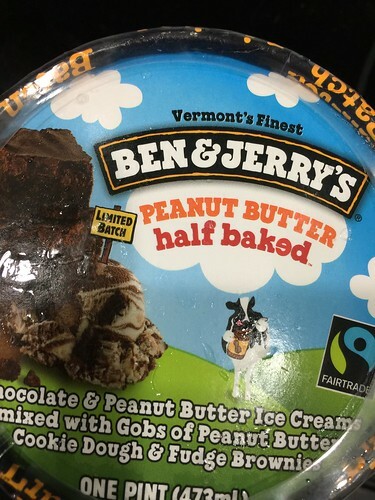 That being said — this Peanut Butter Half Baked is an absolute dream if you love chocolate and peanut butter. The ice creams are rich and the textures from the cookie dough and the brownie bring some serious chew and additional joy to this absolute assault on your taste buds. And of course it…like the original flavor I loved…is limited. So you have just enough time to get seriously addicted to it before they drop it off the Earth.